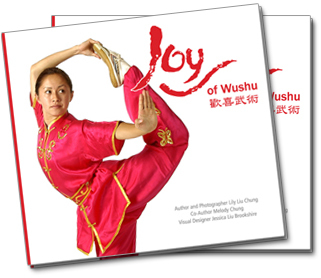 Welcome to Joy of Wushu === This book is a nonfiction manuscript that aims to inform, inspire, and delight readers of all ages. Thank you everyone for coming to the book event on July 30 at Borders. We would like to thank all the performers for doing an impressive job! JOY OF WUSHU (What is Wushu?) is a nonfiction manuscript that aims to inform, inspire, and delight readers of all ages. Coupled with over 100 high-quality, full-color photo arts, Joy of Wushu strives to portray the beauty and sophistication of Chinese martial arts and provides a gateway to understanding the basic principles of Chinese Wushu.